In my opinion, the Roku box is the best non-gaming streaming device in the market today thanks to the lineup of content available. And in case Santa didn’t bring you one for the holidays, I’m giving away another NETGEAR Roku NTV250 player to one lucky reader of my blog. To enter the drawing, all you have to do is leave one comment on this post and make sure you submit the comment with a valid email address. The drawing is open to anyone with a mailing address in the U.S. and I will select one winner at random on January 31st. 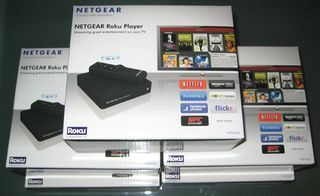 Thanks to NETGEAR for the giveaways and congrats to Ron Ramkirpaul and Gina Sepowski who won the previous giveaways.